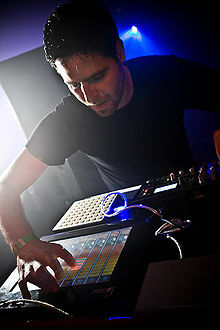 Guilherme Boratto (born 1974 in São Paulo) is a Brazilian electronic music producer. In the 1990s, he was a member of Sect. He owns the record label D.O.C., distributed by Kompakt. The first artist he signed was the Brazilian electronic duo Elekfantz. On stage, Boratto uses a laptop equipped with Ableton Live, a JazzMutant Lemur, a monome and an Akai APC40. He sometimes invites a guitar player to join him. 2007 Eyerer and Chopstick "Haunting (Gui Boratto Remix)"
^ Thiessen, Brock. "Gui Boratto Tells Stories", Exclaim!, April 2009. ^ "RA: Gui Boratto: Like you - Interview". Residentadvisor.net. 2008-03-14. Retrieved 2013-08-06. This page was last edited on 24 February 2019, at 02:12 (UTC).